The revolutionary ForeverAire Premium Guest & Sofa Sleeper Mattress features adjustable firmness control with patented Auto Shut-Off empowering sleeper's to customize their sleep environment at the touch of a button. Many competitive models are notorious for leaking overnight. The ForeverAire Premium Guest & Sofa Sleeper Mattress features our patented Silent Night Comfort Adjust Backup Pump that automatically maintains air pressure even in the event of a minor puncture, so sleeper's aren't bottoming out by morning. In addition, the ForeverAire Premium Guest and Sofa Sleeper Mattress features a reinforced DuraFlex Ripstop Fabric design that is resistant to everyday abuses like pinch points, punctures and perforations easily caused in unreinforced vinyl mattresses. Last but not least, the ForeverAire Premium Guest and Sofa Sleeper Mattress DuraFlex Ripstop Fabric enclosure is breathable and helps keep sheets and bedding in place. "Enjoy affordable - guest bed and/or sofa sleeper satisfaction like never before!" 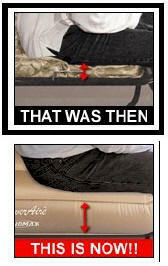 DuraFlex™ Ripstop Fabric Strength: Protects The ForeverAire™ Mattress From Everyday Abuses Like Punctures. Abrasion Resistant Enclosure: Prevents Punctures and Perforations Otherwise Easily Caused In Unreinforced Vinyl. Stretch Resistant Laminate: Prevents The Pressure Loss Common With Plain Vinyl Air Mattresses That Stretch Overnight. Hygienically Advanced: Antibacterial and Odor Resistant Enclosure Material Is Washable and Hypoallergenic. DuraFlex™ Ripstop Fabric™ Technology: Protects The ForeverAire™ Mattress From Mold & Mildew. Patented Auto Shut Off Pump: Customized Comfort, Automatically Shuts Off Upon Reaching Selected Firmness Level. Patented Silent Night Comfort Adjust™ Backup Pump: Automatically Maintains Air Pressure In The Event Of A Minor Deflation. 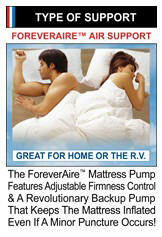 Customized Pressure Inflation: The ForeverAire™ Mattress Pump Features Adjustable Firmness Control. Accurate Firmness Control: The ForeverAire™ Mattress Constantly Reads Pressure To Maintain Firmness. DuraFlex™ Ripstop Fabric Softness: While Extremely Durable, The ForeverAire™ Mattress Has A Very Soft Feel. 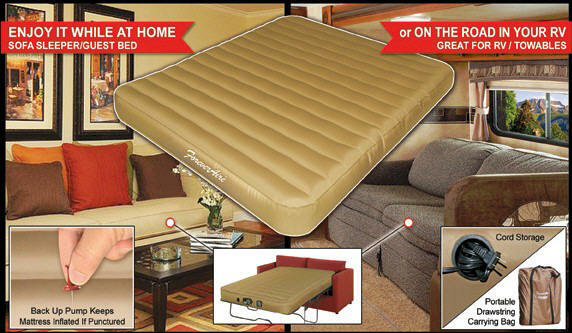 Simple Auto-Off Deflation: The ForeverAire™ Mattress Also Includes Simple Automatic Deflation Control. Fits Standard Size Sheets: The ForeverAire™ Mattresses Are Available In Full & Queen Sizes To Fit Standard Size Sheets. DuraFlex™ Ripstop Fabric™ Comfort: Breathable Fabric Enclosure Provides More Comfort Than Sleeping Directly On PVC Vinyl. Body Contouring I-Beam Design: I-Beam Support and Durability Is Far Superior To Lumpy Unreliable Coil Mattress Designs. 100% Leak Tested: ForeverAire™ Mattresses Are All 100% Leak Tested For Long Trouble Free Life.